Will Cambodian Prime Minister Hun Sen give the green light for Prince Norodom Ranariddh’s comeback? Cambodia’s Prince Norodom Ranariddh has made something of a minor media splash by recently announcing his return to the political stage, where his former royalist party Funcinpec has been all but obliterated by the ruling Cambodian People’s Party (CPP) of Prime Minister Hun Sen.
As one of the country’s many contenders for the throne should the current king step down, he might be quite chuffed by sections of the media, which lauded his move as that of a political heavyweight—a far cry from the gormless and galling antics that became the noted hallmarks of the royal party under his stewardship. Funcinpec led the Cambodian government back in 1993 and has stepped in from time to time, whether in opposition or part of a coalition with the CPP, over the years. In doing so, it has been in a position to play an important role in Cambodia’s fledgling democracy. However, Funcinpec currently holds just two seats in the 123-seat National Assembly after voters—frustrated by years of corruption, greed and sheer incompetence—deserted the party in droves for the CPP and the opposition Sam Rainsy Party (SRP). And Ranariddh is still unwanted in the slim corridors of power at Funcinpec, where he was finally excommunicated for fraud in 2006 after he sold off the party’s headquarters, located on a prime piece of Phnom Penh real estate, and pocketed the money. He was sentenced to 18 months in jail in absentia. A royal pardon was granted and he established the Norodom Ranariddh Party (NRP) which, like Funcinpec, won two seats at the 2008 poll. Dismayed, Ranariddh left politics altogether soon after and the NRP was renamed the National Party. Now all that’s old is almost new again. But not before Ranariddh decided to test the waters, although not with the electorate or the party. When seeking permission to rejoin the political fray, according to observers close to the parties, Hun Sen simply told Ranariddh: ‘It’s up to you.’ In other words, Hun Sen was simply saying it’s not his decision. It wasn’t quite the response Ranariddh wanted to hear. 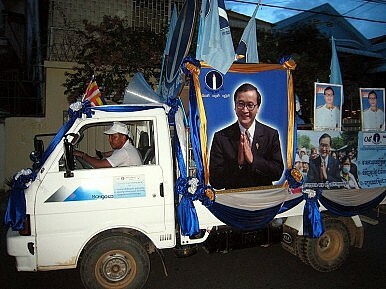 With a few tentative steps the party has reverted to its old name, the NRP, with Ranariddh as president and amid some slight, even timid, chest thumping declared he intends to unite all royalists ahead of 2012 local elections and general elections to be held a year later to fight Hun Sen and the CPP. That’s if Hun Sen says yes. Well, maybe.